Keith Sellars (in blue DHNC shirt) leads the march with his family. All photos by the author. Editor's Note: Shortly after this story was published, Scalawag learned that Keith Sellars and his family are facing eviction. You can learn about a campaign to save their home here. The DHNC march passes Colonial Hardware on Elm St. 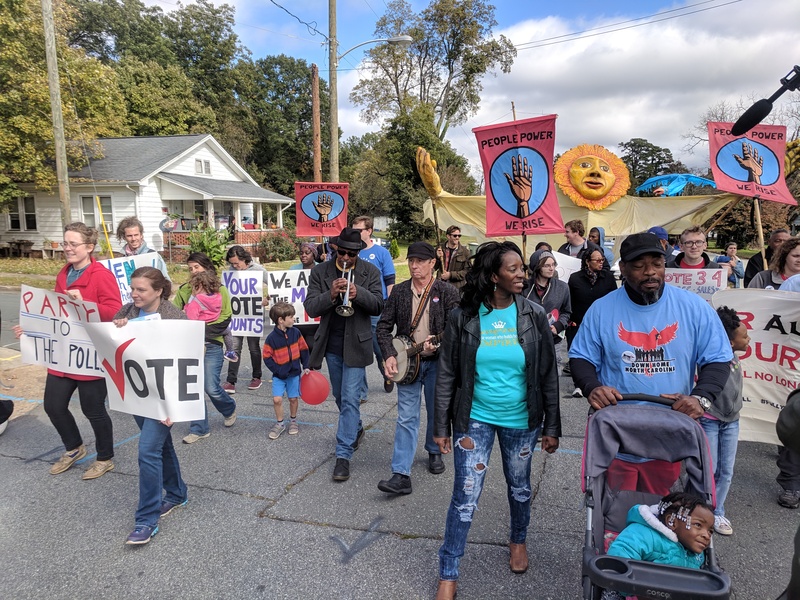 Founded in 2017, DHNC aims to build a multiracial, working class organization in rural North Carolina. The group started with a long listening canvass in Alamance County—home of Graham, located halfway between the major urban centers of Greensboro and the Triangle—and Haywood County—near Asheville in the mountains. But they’ve been growing in the lead up to the election, starting electoral canvassing operations in other mountain counties, including Swain, Jackson, Yancey, and Madison. DHNC members did the standard electoral work, vetting candidates, holding town halls, and knocking doors—23,000 of them. But even while they were talking to voters, they were looking far beyond Election Day. Ask any member about the organization, and you’ll hear the same thing: what makes DHNC different is that they stick around. Ask any member about the organization, and you’ll hear the same thing: what makes DHNC different is that they stick around. Instead, DHNC members speak to the need for deeper community engagement, building up the capacity for working people to take control of their own lives. This isn’t importing an electoral machine to throw bodies behind a candidate that appeals to the party apparatus: it’s about organizing their own community so that they can live the lives they want. DHNC’s own organizers are the best example. Davis was born and raised in Madison County. An organizer with Obama in 2012 and ’14, he was working at Wal-Mart, planning on sitting this election out until he joined DHNC. Amanda Gomez, another DHNC canvasser in the mountains, is from nearby Waynesville. She’s a single mother who was living in an unheated cabin on her grandparents’ land before getting a deal on rent from a friend. A young marcher practices holding a Paperhand Puppets sign. By the time a beat-up school bus from Culture Mill, a “performing arts laboratory” in nearby Saxapahaw, finished its circuit picking up voters around the county, there were around fifty people in the church’s yard. Early Destiny’s Child pumped through a sound system while children kicked a soccer ball, and conversations in English and Spanish merged under a large tent. A young girl did the MC Hammer dance. Artists from Paperhand Puppet Intervention gave demonstrations in how to carry the giant, multi-person puppets they brought for the march. And Keith Sellars worried about what he would do when he got to the polls. Sellars grew up in Burlington, the Alamance County seat. He says his community grew apart around the time he and his friends were reaching adulthood—Black men hitting their late teens in an era of deindustrialization, surrounded by closed mills and no jobs. They were targets for mass incarceration. Sellars was one of them. He was on probation when he cast his ballot in the 2016 presidential election. But those on probation for a felony in North Carolina don’t have the right to vote. Sellars was arrested again in December 2017, charged with felony voter fraud. Eleven others were arrested for the same reason—nine of them Black. Keith Sellars (in blue DHNC shirt) and his family lead the march with the historic courthouse in the background. While groups focused solely on the election might miss the struggle of the Alamance 12, simply hitting up likely voters to boost turn-out, DHNC dug in. DHNC turned the Alamance 12’s plight into a rallying cry against the antidemocratic control exercised over the working class—and the central role of white supremacy in maintaining that control. “It’s a strategy to stigmatize, to intimidate, to derail, and to disenfranchise people of color,” said Sellars, whose voting rights have since been restored. Between bites of barbecue and beans, DHNC member and volunteer Jwan Johnson explained that it was DHNC’s support of the Alamance 12 that first attracted him to the group. “Voting is a start,” he said. “We need people who can identify with the issues” in areas like Burlington. DHNC targeted three state House of Representative races, looking to gain General Assembly support for better wages, housing, and healthcare. Johnson spoke of the importance of voting for politicians who will ensure the vacant mills—some empty for decades now—turn into projects that benefit the working class, not the luxury mixed-use developments popping up across the South. Two musicians lead the crowd in a sing-a-long. Locally, DHNC is also trying to stop Alamance from rejoining 287(g), the program allowing sheriffs to become foot soldiers for Immigration and Customs Enforcement’s attacks on the immigrant community. To do so, DHNC partners with groups like Siembra NC, which organizes the undocumented Latinx community. “As a person who cannot vote, representing many other people in this community who cannot, I ask you to vote for policies that will create a more equitable society,” said undocumented Siembra activist Laura Garduno-Garcia in a speech to the crowd. The march passes by the historic courthouse and a Confederate monument. The symbols of the historic crimes DHNC must overcome are everywhere. The group’s Alamance office is in an old Dixie Outfitters, a faded Confederate flag still visible on the mostly empty shopping center’s sign. Nearby is the intersection of Plantation Drive and Corporation Parkway. But they are also operating in a changing South. New investment gives a new sheen to the old order. Capital is moving into communities devastated by divestment, though the only change for much of the working class is increased rents and the destruction of their culture. So DHNC aims to use what’s always been here—the communities and cultures of the long elided, but beautifully diverse South—to build a more equitable home. The march in Graham was only a few blocks long, but all of those Souths were on display. The crowd held their giant puppets high, calling out to neighbors on nearby porches. With the sun now shining, the crowd rounded onto Elm Street, passing by Farm Services, Inc., Colonial Hardware, and the soda shop. They circled around the court house next to the Confederate Monument and past a bar with a sign demanding protection for that monument. They filed past a bottle shop and the local newspaper offices and finally to the polls, where they hugged friends and neighbors and politicians they’re creating relationships with. The election itself didn’t work out as they would have liked. Only one of the DHNC-backed candidates won—though another lost by less than 300 votes. Statewide, Democrats broke the supermajority Republicans have used to turn North Carolina into a laboratory of oppression, but no blue wave materialized. The state also passed regressive constitutional amendments capping the income tax cap, ensuring voter ID laws, and supporting a “victim’s rights” law that threatens due process. But the election was never the whole point—not exactly. DHNC’s gambit is that the divisions of party and race that have been used to reinforce a class hierarchy can be overcome with the solidarity of communities coming together to fight for each other. Whether it’s against luxury condos, wage theft from the undocumented, century-old voter suppression techniques, or opioids, the working class can win if only we are organized. To think one election could make or break DHNC’s project is to misunderstand what they’re doing. White supremacy will never be voted away. North Carolina—and the South, and the country—will become equitable not when the right nominee appeals to the right demographics, but when the entire working class comes together to determine its own future. North Carolina—and the South, and the country—will become equitable not when the right nominee appeals to the right demographics, but when the entire working class comes together to determine its own future. So the point is that Keith Sellars marched to the polls with a crowd of friends and family and neighbors, and was able to cast a vote knowing that whatever the Right will do to silence him, he has a community ready to support him. The one thing Peña lamented was that she didn’t think to bring more foil for the leftovers. But still she made me promise to take a plate for the road. This story has been updated to reflect the final outcome of the North Carolina House District 63 race.